In 1-quart saucepan, heat brown sugar, cornstarch and orange juice to boiling over medium-high heat, stirring frequently. Boil and stir 1 to 2 minutes or until syrup is slightly thickened and mixture is clear. Remove from heat; stir in orange segments. Keep warm. Heat waffle maker. (Waffle makers without a nonstick coating may need to be brushed with vegetable oil or sprayed with cooking spray.) In medium bowl, stir waffle ingredients with wire whisk or fork until blended. For each waffle, pour batter onto center of hot waffle iron. (Check manufacturer's directions for recommended amount of batter.) Close lid of waffle maker. Bake 3 to 5 minutes or until steaming stops. Carefully remove waffle. 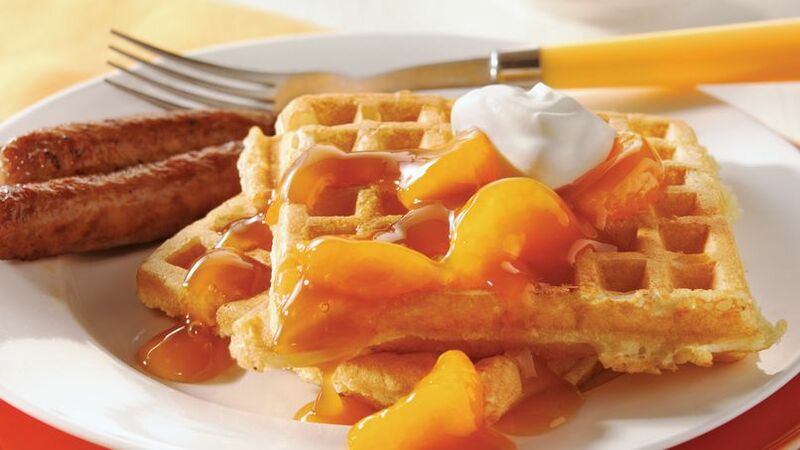 Serve waffles with syrup and topping. Use a fork as a tool to lift the waffle from the waffle maker. It'll help prevent the hot waffle from breaking, and you won't burn your fingers.